Game Remakes provides a new version of the classic board game Risk. Of the many Risk variants out there on the internet, sometimes it can be hard to find the simple classic Risk game. Primarily this has to do with the rights to reproduce the game, which Hasbro has the lock down on. Many of you may know of the website called Big-Fish Games. The company that owns Big-fish called EnErGames, has another little-known website called Games-Remakes.com. Here you can find licensed classic games and are able to play Risk online. The good and bad of playing Risk online at Game Remakes is that the game in and of itself is simple. You won’t find hundreds of maps or ways to play or very good AI, but you will be able to play the original classic Risk game. Game Remakes has three versions of the game available. A Mac, PC, and Online version. The Mac and PC versions are downloadable for $9.99 US dollars. The online version is a trial version in order to get a feel for what the game plays like once you have downloaded. 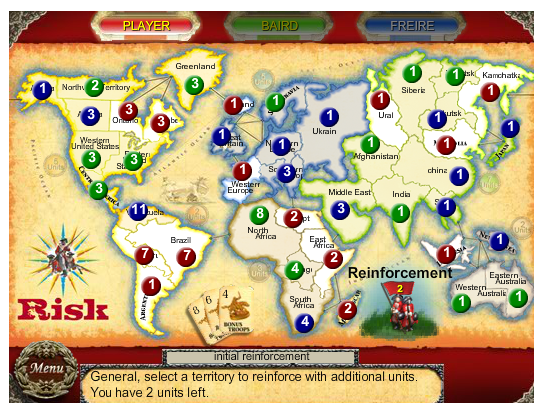 The website is easy to navigate and you can find more than just a place to play risk online at. You will find that you can play many Hasbro games, among other classic board games, all in one convenient place. Many of the games are free to download to your computer and require very little in specifications to play. For instance, downloading Risk only requires that you have the following specifications on your personal computer. Most personal computers in this day and age meet that requirement and you may even be able to use your smartphone, tablet, or laptop to connect to the website and play Risk online from anywhere. While it is the standard Risk game we all love the game is stripped down to its basics. The differences between the online and downloaded versions are significant. The graphics on the online version are clear but they are the low definition and there is no full-screen option on the online version. You will play the entire game in a small window in your browser. The maps are different and the way the game plays is different. In the downloaded version, you are able to choose different maps and play against different AI opponents. Whereas in the online version you have the same two AI opponents no matter how many times you come back to play. The biggest difference though is that in the downloaded version you have far more options to choose from and the versatility of the game is apparent. The basics of the game are the rules we all expect. The downside is that you do not have the option to choose your own territories at the start of the game. They are selected at random. Once the territories are randomly selected and a single unit placed on it, you then can reinforce those units manually with your leftover troops. While this makes for a very fast game, people who enjoy choosing their strategies based on the territories they claim in the beginning will find that this particular style of play is not as fun. 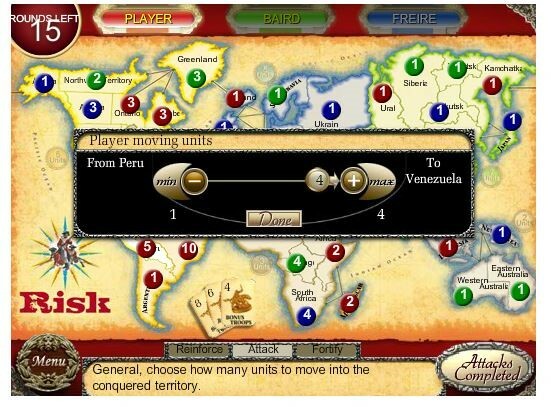 However, if you find that aspect of the game tedious then you may enjoy this quick online version to play Risk online. The dice mechanic was a nice surprise. The dice actually roll and you can see a miniature graphic of which dice was destroyed or cancelled out by the others. As expected the defender always wins and the dice rule of the attacker being allowed to roll up to three dices is also in place. Some Risk clones have variations on these rules but because this is the official Hasbro edition you can expect that the rules you are used to in a standard board game setting will be applied here. There are cards in the online version and the downloaded version. The cards are handed out at each turn. If a player collects either three cards with the same symbol, or one of each, or two different and a wild card, they may be traded in for reinforcements at the beginning of a player’s turn. Some players enjoy playing Risk online where the cards are passed out at the beginning of the game and might find this aspect of the game different than what they normally experience while playing Risk, especially if they are used to playing on the many Risk clones out there. The secret mission rule variant is also absent from the online version. You can use it in the downloaded version. One of the best factors about playing Risk online at Game Remakes .com is the ease of use. Moving units between territories was easy as point and click. Attacking another territory, you simply click on your territory, and then click on the one you want to attack, and then press attack. You can easily see which territory is being selected because the button on the territory pops up on the screen to give you a visual reference. 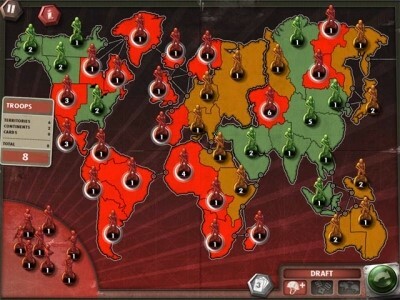 Overall the game is what one would expect from an official version of classic Risk. 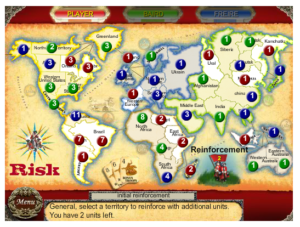 There are pros and cons to playing Risk online at Game Remakes .com. If you are looking for a fast, low graphics demand, place to play Risk online, then this is probably the best place to go. If you want the standard game with no frills, then this is the game for you. If you want more from your Risk game than what you would find in your board game box at home, then it may not be the best choice for you.